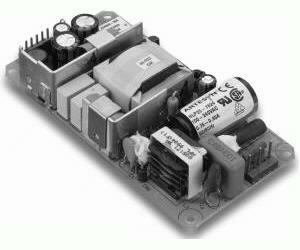 The NLP25 series is a 25 W universal input ac-dc power supply on a 4.00 x 2.07 inch card with a profile of less than 1 inch. The availability of four single output and three multiple output models in an extremely small package size makes the NLP25 ideal for use in space critical, low power communication applications requiring an off line power solution. The NLP25 provides 25 W of output power with free air convection cooling that can peak at 30 W for 60 seconds. Standard features include overvoltage and short circuit protection. The series, with full international safety approvals and the CE mark, meets conducted emissions EN55022 level B and complies to EN61000-4-2, -3, -4, -5, and -6 immunity standards. The NLP25 series is designed for use in off line, low power data networking, and computer applications with limited space, such as hubs, routers, POS terminals, external disk storage, and cable modems. The availability of 5 V outputs in single and multiple configurations provides a solution for a myriad of microprocessor applications.